The Military tension between Houthi and Saudi Arabia started in 2015 and from then onwards controversial dispute between Saudi Arabia and Houthi is continued which has not reached any conclusion yet. There are a lot of different stories caught in the minds of people during this Conflict. Here is one of the most heart touching patriotic and dedicating stories of a Saudi sniper who was martyred during fighting with Houthis group. Naif Farhan Al-Harbi was a Saudi and blessed with great talent. He was a skilled sniper who was killed during the fight against the Houthis. Naif Farhan al-Harbi volunteered himself on the frontier lines of southern direction where he was later martyred. Saudi sniper, Naif Farhan al-Harbi was a father of two loving daughters. Since 2009, Naif was a part of the military police forces and got trained as a sniper. After he became an excellent sniper, he volunteered himself and joined the Saudi armed forces in Fourth Brigade. In October, Naif Farhan al-Harbi got serious injuries during a rescue mission, however, he did not give up and stood again after a serious brief recovery. He took a decision for the sake of his homeland and decided to go back to the front lines. The sniper filed a request for more extension in his duty and asked to be posted in the same military site which is one of the most uncertain and vulnerable locations on the border of Saudi-Houthi. When Al-Harbi came back to the duty on the front lines after canceling his vacation, his car was targeted and destroyed by a missile which killed him and another soldier. Two other soldiers were injured. He was so patriotic that he just canceled his holiday plan and at the eleventh hour got back to the war zone. 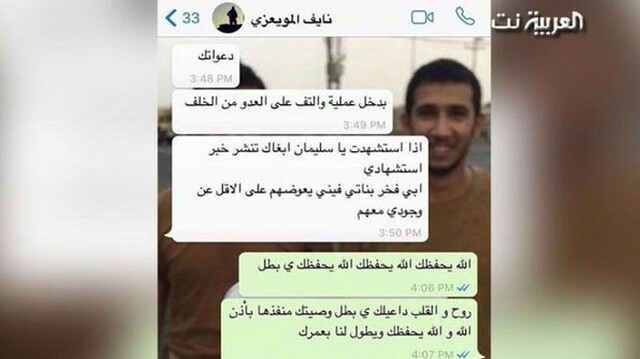 Naif Farhan al-Harbi gave his great will with full confidence to his friend by quoting that he should publish the martyrdom news of this dedicated Saudi sniper as a mark of pride and respect for his two loving daughters. May Allah bless his soul in peace (Ameen). We rarely reach such kind of stories of dedication, patriotism and sacrifice these days. He was a real son of the motherland who sacrificed his life to protect the Holy Land.